I just finished making brownies (from a box) with my granddaughter Charlotte who is in Junior Kindergarten. I was reminded about all of the ways both math and literacy can be injected into a fun time. I baked with my own children when they were young but I know I was not as explicit about opportunities to build math content knowledge. When we got the measuring cups out I was reminded about the challenges many students in the later grades have with fractions so I took out my four measuring cups – 1 cup, 1/3, 1/4 and 1/2. I turned the water on and asked her how many of the one-fourth cups it would take to fill the 1 cup. She said two so I said, let’s find out. After discovering that it took exactly four we tried the same thing with the half cup and she predicted three. After we found out that it took two, we lined the cups up from smallest to largest. I pointed out the one- third cup and asked her how many she thought it could take to fill the one cup. She predicted three and she discovered that it was indeed three. We also had the opportunity to talk about the shape of the square pan and the round bowl (circle). She showed me that she was able to recognize these shapes and I made sure that I said that a square is a special rectangle. After we were finished, Charlotte asked me a very important question, “Can I lick the spoon?” Of course, I said yes, but I also added that a very important part about baking is cleaning up! Another time we will talk about cutting the brownies up into equal parts. So many ways to inject many important ideas into a fun experience. 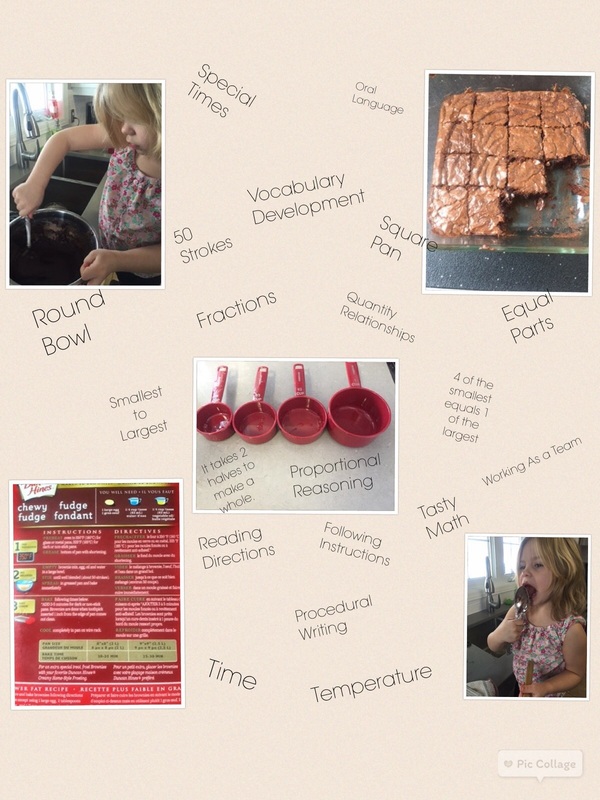 Next time you want to do some math with your children or grandchildren have fun baking and talk together about what you are doing! What if homework was always that tasty! Next Next post: Explicit Teaching – Timing is Everything!